$50/hr. Minimum rental time of 2 hrs. Add an afternoon tea to you event for $32/ guest. May bring a cake, but no other outside food is allowed without approval from Elden Street Tea Shop Event coordinator. - Delicious, seasonal afternoon tea sandwiches. - Beautifully prepared assortment of desserts. - Of course, pots of tea! - Service ware and linens are available for use. - Staff for the event. - You may bring a cake, but all other outside food is prohibited. Decorations are allowed, nothing can be nailed or damage the facility. Menu accommodations for food sensitivities can be made upon request. Finalized food menu is done 3 weeks before an event. We offer custom Event blends FREE of charge! Take home Bridal and event blends in adorable apothecary tea bottle for $10/ guest. $350/ 4 hr. Minimum rental time of 4 hrs. Add an afternoon tea to you event for $24/ guest. Want to have a tea party in the comfort of your own home without the clean up? 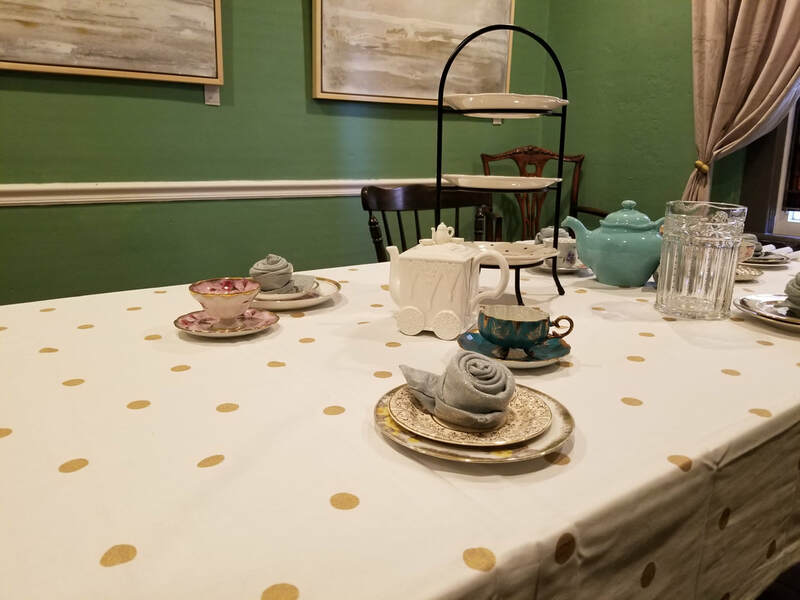 Let Elden Street Tea Shop bring the tea party to you! Looking for that perfect spot to host your weekly book club or stitching group? Elden Street Tea Shop is the perfect place for your club to meet! We have small rooms available with flexible pricing!